Results include the collection of 14 thousand trash bags by nearly a thousand volunteers and 26 clean up groups in 15 regions around the destination. 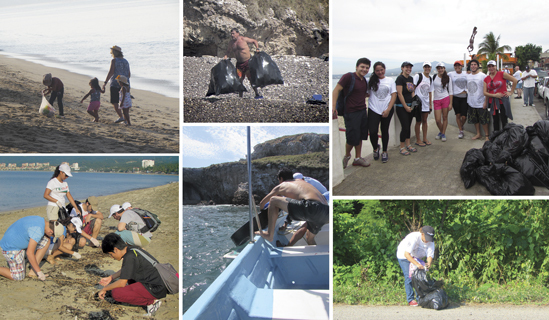 The Riviera Nayarit Beach Cleanup Network (BCN) turns two on June 11, 2016. On that day, several groups of volunteers will gather along the coast of Nayarit to take part in the 25th cleanup of beaches, rivers, islands and ravines. “Congratulations and thanks to all those who have made this environmental and cultural project possible, one that has united several different sectors and encouraged improvements in the community,” said Marc Murphy, Managing Director of the Riviera Nayarit Convention and Visitors Bureau. Between June 7, 2014 and now these groups have collected 14 thousand black trash bags filled with waste. During these past two years nearly a thousand volunteers have participated within 26 cleanup groups that have formed the movement. Civil associations, hotels, private business, authorities and schools have all lent their support to these massive cleanup actions in the Riviera Nayarit. Specialized cleanups have also taken place on Islas Marietas, mainly by tourism service providers. The BCN has done work in the following areas: Los lugares por los que ha pasado la RLP son: Nuevo Vallarta, Boca de Tomates, Bucerías, La Cruz de Huanacaxtle, La Manzanilla, Playas de Huanacaxtle, Punta de Mita, Las Islas Marietas, Sayulita, San Pancho, Lo de Marcos, Los Ayala, Rincón de Guayabitos, La Peñita de Jaltemba, Platanitos, San Blas and La Isla Mexcaltitán. There are approximately 160 miles between the benefitted counties of Bahía de Banderas, Compostela, San Blas and Santiago Ixcuintla. Tropical Incentives has joined in the efforts during this second anniversary in support of La Cruz de Huanacaxtle. The Riviera Nayarit CVB coordinates the groups and provides the volunteers with supplies including water, t-shirts, caps, gloves and bags.